We have come to understand that fear and stress in large part generate the experience of pain of labor. In short, the hormones of fear – our fight-or-flight hormones – inhibit the production and flow of oxytocin, endorphins and other hormones of birth. 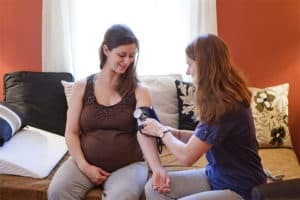 Oxytocin - and endorphins, nature’s opiates - are the very hormones that cause effective contractions, and also reduce your pain and stress, calming you and your baby. Labor medications interfere with the production and flow of these supportive hormones. Natural methods of pain management support their production and bring you all of the benefits packaged in these little chemical wonders. Some women who want a natural birth have been concerned that self-hypnosis is a way of disengaging from the labor, and therefore something they don’t want. My answer to them is that, because of the nature of labor, one must be engaged in some way with the contractions, so why not try a way that significantly reduces, or even eliminates, the pain. Women report that they are very aware and that the contractions are very intense experiences, but not painful – that in fact, they are often deeply satisfying. 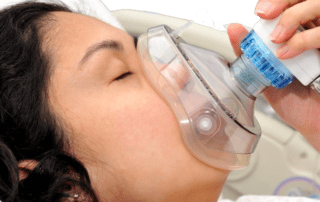 Nitrous oxide works by increasing the release of hormones made in the mother’s brain that reduce anxiety and provide her with pain relief and a sense of well-being. It is mixed with oxygen and self-administered by the mother herself through a mask she holds to her face - usually at the peak of contractions. This allows the woman to decide when and how much nitrous oxide she needs for pain control. She can stop using nitrous oxide at any time, and it begins to dissipate immediately after she stops breathing it through the mask, taking the effects only minutes to disappear.